The icy satellites of the outer solar system pose numerous puzzles, one of which is sometimes referred to as the Mimas-Enceladus paradox (e.g., Czechowski & Witek 2015). This is the question of why some icy bodies (e.g., Mimas, Rhea, Callisto) have stayed cold, while several others (Enceladus, Iapetus, Europa, Ganymede) have undergone intense processing. 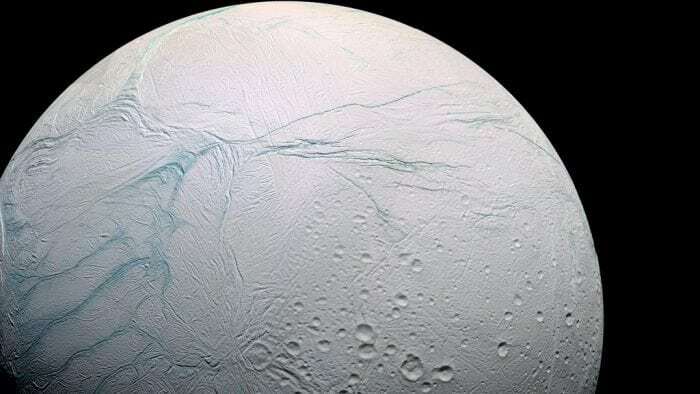 Of a special interest is the case of Enceladus, the sixth-largest moon of Saturn. Covered mostly with fresh ice and containing a noticeable fraction of rock and metal in its depth, this moon is best known for the vapor plumes regularly emanating from the so-called tiger stripes, near- parallel linear depressions in the Enceladean south-pole zone. This poses two questions. One, specifically, is whether the tidal heating in Enceladus is sufficient to sustain the observed cryovolcanic activity. Another question is more general: what circumstances split the geological histories of bodies which were accreting in similar conditions? The answer to the first question can be obtained relatively easily through a back-of-the-envelope estimate. Analysis of the data from the NASA Cassini spacecraft has shown that the outgoing energy flux due to the vapor plumes on Enceladus is about 10 GW (Kamata & Nimmo 2017). It has also been demonstrated by Chen et al. (2014, Table 3) that the dissipation rate associated with the Enceladean global subsurface ocean is much smaller than the overall heat emitted by this satellite. Therefore, if we assume that the power of the geysers ( 10 GW) is about equal to the overall heat dissipated in Enceladus by the Saturn-generated tides, then it will be legitimate, for the purpose of estimate, to neglect the presence of the ocean and to approximate the tidally produced heat with a simple expression for the tidal heating rate in a homogeneous icy ball tidally perturbed by the host planet. Since this expression contains viscosity, the said approximation must render an estimate for the average viscosity of the Enceladean icy mantle. This work was done in Efroimsky (2018a), and the obtained value of the average viscosity ( 0.24 × 1014 Pa s) turned out to be remarkably close to the viscosity of ice near the melting point. This confirms the assumption that the tides generated in Enceladus by Saturn are sufficient to sustain the plume activity in this moon. No additional sources of heat are needed. We should be comfortable with this finding because the radioactive components of the rock and metal fraction of Enceladus are expected to have long decayed. Unfortunately, this estimate does not automatically provide an answer to the second question. The tidal damping rate is inversely proportional to the viscosity, while the viscosity increases about exponentially with the decrease of temperature. This way, at a very low initial temperature the rate of tidal heat production is expected to be too low to warm up the body appreciably. Could radioactivity be of help? To count on this source of heat, we must presume that the moons, which have undergone a bonafide geological history, were accreted concurrently with the planet, some 4.5 Gyr ago. More precisely, their accretion ought to have happened when a sufficient amount of the radioactive material still was around (Schubert et al. 2007). While in the course of their accretion the moons might have swept a large number of calcium-aluminum-rich inclusions (CAI’s), it should be kept in mind that the radioactive isotope 26Al initially contained in these inclusions was short-lived (its half-life being only 0.7 Myr). This scenario would then imply some degree of fine-tuning. Or, more well-put, right timing — which is an argument against the naive scenario. More importantly, the recently developed models of Enceladus’ formation (Charnoz et al. 2011, Salmon & Canup 2017, Asphaug & Reufer 2013) advocate for a much later time of its birth, a time when none of the radioisotopes were around. Then what mechanism might heat up an icy body from its originally cold state? And why was this mechanism so effective in Enceladus (and, possibly, in some other moons), but failed to work in the objects like Mimas? What factors or occasional events could have been responsible for the discrimination? In the absence of radioactivity, tidal dissipation remains the only realistic source of heat which might have partially molten Enceladus’ interior and initiated the geological processes in it. But then, as we mentioned above, the problem with this option is that a cold nascent Enceladus had a viscosity much higher than today, wherefore the rate of tidal damping in it ought, seemingly, to be much lower than now. Could there have emerged an additional circumstance capable of enhancing the intensity of tidal dissipation? One possibility, first hypothesized in Makarov & Efroimsky (2014) and then explored in detail in Efroimsky (2018b), is that libration in longitude might in some situations have caused a noticeable increase in tidal heating. Specifically, it was demonstrated in the latter work that, independent of the rheology, forced libration in longitude is responsible for 52% of the tidally dissipated power in Phobos, 33% in Mimas, 23% in Enceladus, and 96% in Epimetheus. The libration-generated input in tidal heating depends on the magnitude of forced libration — which, in turn, depends on the value of the moon’s dynamical triaxiality, (B−A)/C, where A ≤ B < C are the principal moments of inertia. The example of Epimetheus demonstrates that an icy moon may have been formed with a considerable triaxiality, or may have acquired a high triaxiality through a collision. This example also demonstrates that tidal heating due to intensive libration may, in principle, have boosted dissipation by one or two orders of magnitude. This might have been sufficient to warm up the interior so that the viscosity started to decrease, thus giving way to even more intensive heating. Eventually, this might have led to the melting of parts of the interior, to differentiation and, eventually, to cryovolcanism. It should also be added that in the cause of this evolution the body as a whole becomes softer and its permanent triaxiality decreases to a value for which tidal heating becomes less intense. This scenario may be of use to explain why some of the Saturnian large icy moons (Enceladus, Iapetus) warmed up in the past, while others (Mimas) remained cold. These findings are described in the articles entitled “Dissipation in a tidally perturbed body librating in longitude” and “Tidal viscosity of Enceladus,” recently published in the journal Icarus. This work was conducted by Michael Efroimsky from US Naval Observatory. Michael Efroimsky is an American astronomer of Russian origin. His research interests are in celestial mechanics and relativity. He is working as a Research Scientist at the US Naval Observatory in Washington DC. Michael Efroimsky is a member of the International Astronomical Union and the American Astronomical Society (AAS). In 2008 - 2009, he served as the Chair of the Division on Dynamical Astronomy of the AAS.